Photographing newborns is always a moment of sweetness. A calm quiet house, the enchantment of the little fingers and toes, and the stillness of a sleeping baby. Though most newborn photos will take some time to capture, it is usually a simple waiting game for baby to settle in sleep as you move them through the poses. Meeting Baby Lyndon, Caroline and I expected the same. Little did we know he had something else in mind! Talk about the strength of steel . . . this beautiful little boy at 7 days old was wide awake the full 2+ hours we were there, with a finger grip that could cut circulation. He was determined and strong and we were bent to his will! Though he would leave a special mark on mom during our session, seeing the sweet hat from grandma, his first teddy bear from grandpa and all the fun hockey toys and Minnesota Wild outfit, this little boy charmed our hearts and gave us such a fun session. Seeing his strength and the love of his family and friends, we know he will achieve all that drivesand nurtures him. PS. This was another Caroline Anne session, with Caroline behind the lens and Christine getting to play with oh-so-cute little baby! Welcome to the World, Maylee Renae! In recent months, I have been delighted to work more and more with Caroline as my second shooter. Capturing weddings, engagements, special events... it has all been delightful. Then this weekend, I had the honor of stepping back and working with her as her assistant on her first principal shoot. While I worked more closely with the baby, it was Caroline who took the camera lead and captured today's beautiful post. Congratulations, Caroline, on a beautiful session. The following is her blog post. This weekend, I had the amazing privilege of photographing my dear friend's 6-day old daughter. I have been so lucky to watch the amazing miracle of pregnancy working side by side with my Sherwin Williams Manager, Katy. The questions and curiosities of what was to come were so much fun to hear. Finally, on September 20th, I got a text, "That was so instense." I responded in confusion. Beautiful Maylee Renee had been born at 8:36pm weighing 6 lbs, 10 oz. Congratulations, Katy and Matthew, on your darling baby girl! Beautiful Girls, A Beautiful Day! I have been honored to know Elise and Lilli for some time, and even more honored to work with them over multiple occasions as they explore a potential path in professional modeling. Saturday marked one more step in their journey as we took in the beautiful day in downtown Saint Paul. While the course of our plans may not have gone exactly as we expected, there was never any worry on my part as these beautiful girls know how to BRING IT and how to bring it in a BIG WAY! Great job, Elise and Lilli! I cannot wait to photograph you again! This weekend, Caroline and I had the honor and privilege of photographing the wedding of two dear friends in Iowa. I have been blessed to know Alissa for many years, and to have photographed her many, many times in that duration. From headshots and theatre performances, to modeling and family photos, and even multiple photos with her beautiful Michael, it has been a long relationship that I have enjoyed and held dear. Standing in the darkness watching her dance with her father and Michael with his mother, I felt a twang in my heart and the tears well up in my eyes. For somehow they felt like my own children and seeing them grow and blossom together presented a moment I knew I would never forget. Soon, I will post a comprehensive gallery of this charming country wedding and all the amazing family that shared in this day. (Including some hilarious photobooth shots!) But, for now, please join me in celebrating this couple as they begin a marriage blessed by love, laughter and many grand adventures! PS. CHECK OUT PHOTOS FROM THE PHOTOBOOTH HERE! Congratulations, Mr. and Mrs. Furry! Seeing things like this after a wedding or session are always so humbling and sweet. If only my clients realized how much I adore getting to know them and being a part of the story of their lives. I love photographing seniors. So many unique personalities, styles and characters. And, if you are lucky, you catch a glimpse of the life that waits to unfold before them. When I met Benjamin, I was delighted to see the car he brought with him for the day. Like most teen boys, he loved his car, the character of it and the freedom it gave him. (As a photographer, I loved that he took the time to show me his favorite angle in which to photograph them together and whenever we had a break, I would catch him polishing it.) It was a fun prop to shoot, and Benjamin was a kind and charming lad with a lot of endearing personality. Over the course of the session, it was no surprise to hear that Benjamin would be pursuing a career in Aerospace Engineering. As I said, boys and their toys! I have no doubt that he will go on to pursue an exciting career with some pretty impressive new creations. Speed, design and flight.... what an exciting life! As most people know, I do not do a lot of weddings in my body of work. While they are always beautiful and fun events, I simply tend to focus on other genres that play to my greatest passions - storytelling and invention. Then I met Bryanna and Zach. From the moment they began telling me of their personal interests in the performing arts, to the fun design for their wedding reception, I knew this was going to be a couple I would adore working with for their wedding. With a passion for movies, performance and stories, their engagement session would not become simply a documentation of a moment or a ring, but instead the channeling of three Disney stories following the journey of love. Today's post features just one of those stories - the kind, lasting love of 101 Dalmatian's Roger and Anita. Seeing Bryanna and Zach navigate the journey of our shoot, it was clear from every moment they looked towards each other's eyes to the way Zach touched and guided Bryanna with such chivalry that theirs was just that. A lasting love that will guide the way of many beautiful stories to come. To see chapter one of their engagement story - 101 Dalmatians - click here! 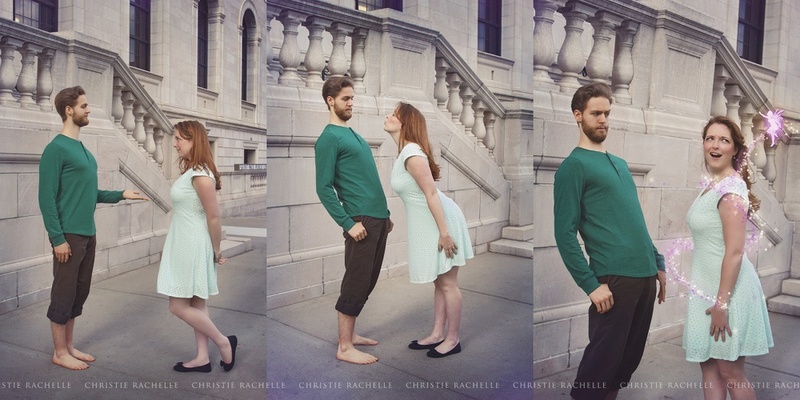 In the final chapter of their engagement session, Bryanna and Zach choose to explore the charming and youthful love of Peter Pan. While everyone remembers this tale for Peter's flights, Neverland and Captain Hook, I love this story for how Peter and Wendy navigate blossoming love for the first time. A thimble, an acorn and a very jealous Tink! These two loving hearts have since tied the knot in a beautiful, fun and memorable wedding. However, before I post the albums dedicated to that time, I wanted to give pause for this last engagement story. Enjoy!